CLEARWATER, FL. — Former Tampa Bay Buccaneers linebacker, Derrick Brooks, was the inspirational speaker at the 4th Annual “Leadership in Action” Speakers Series event. The Leadership Pinellas Speaker Series added both NFL Hall of Fame Inductee Derrick Brooks and Chief Anthony Holloway to the line-up for Leadership in Action. The event took place on January 21 from 6:00 p.m. to 8:30 p.m., and was held at the Margarete Heye Great Room in Ruth Eckerd Hall, located at 1111 McMullen Booth Road, Clearwater, FL. Source: PRWEB. 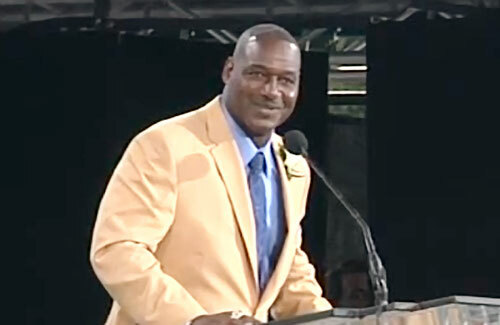 Photo shows NFL linebacker Derrick Brooks delivering his 2014 Pro Football Hall of Fame speech. Re-established four years ago, the Leadership Pinellas Speaker Series provides members with the opportunity to hear from well-known presenters about timely information and skills that can be used in their own businesses and organizations. With the entire Tampa area invited, skills about leadership, communication and customer service are presented from national as well as local Tampa Bay area leaders. Brooks spoke about being a “Champion on the Field and Champion in the Community” that evening. Brooks is a former NFL linebacker who played his entire fourteen seasons for the Tampa Bay Buccaneers. He was elected to the Pro Football Hall of Fame in 2014. He is currently a co-owner and president of the Tampa Bay Storm.